Gojo TFX Hand Wash is formulated with skin conditioners to keep hands hydrated, even after repeated washing. Its rich, thick lather provides a luxurious hand washing experience that is gentle on the skin. The fresh fruit fragrance is pleasant but never overpowering. Gojo Foam Soap is made with an antibacterial formula that kills germs on hands. Each refill is Sanitary Sealed comes with a fresh dispensing valve to lock out germs and help prevent cross contamination. Designed with a clear skylight, you will always know when a refill is needed, eliminating the guess work. 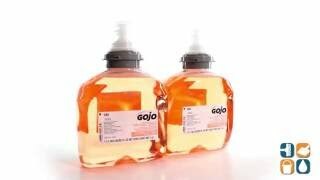 Gojo Premium Hand Soap is for use with a Gojo TFX Touch-Free Dispensers (sold separately, GOJ 2730-12; GOJ 2740-12; GOJ 2789-12). These refills snap into place with an audible click so you know it is firmly in place and ready for use. 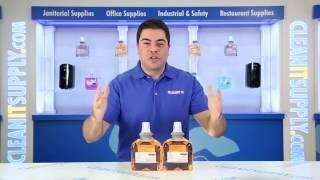 Each refill bottle is easily recyclable so you can save money and protect the planet at the same time. Gojo Antibacterial Foam Hand Soap is ideal for use in any location where frequent hand washing is a necessity. Get yours today! For Use With: For use with TFX™ Dispenser (sold separately).